It can be used safely and with reliable manufacturer products. It is attractive in terms of price. This review is about item#37184341. 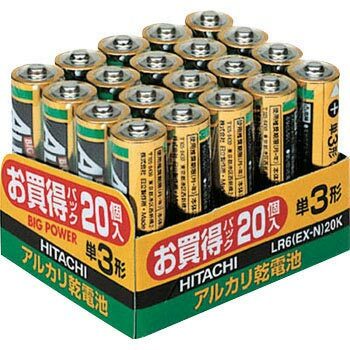 I use it to replace the battery of an electric appliance, but I feel it is cheap. This review is about item#37184095. A good deal pack is good for when saying Isa. I think that it will be fine if it runs out in around 2 years. Because it is an alkaline battery, it feels very affordable. Until now, it was good because it was manganese. This review is about item#37184104. I bought a monoterous product, but the amount of sprayed dropped due to use around 3 degrees in winter, I made it irritated. It is expected for Japanese manufacturers. If possible, I would like you to mention the country of manufacture. As the name suggests, it was a bargain pack. It was disposable so I was looking for something cheaper but even the least was it. For watch remote control etc. This price with Hitachi and Yu first class brand is quite a bargain. It is cheap because we use plenty, and the maker goods are saved. I will stock it again. This review is about item#37184357.